Nissan has announced a series of updates for the X-Trail SUV. The 2017 facelift will give the X-Trail a more gentrified exterior, to bring it in line with big-selling Qashqai, while the interior has been repackaged to provide more bootspace. Nissan hasn't released any pricing details for the 2017 X-Trail, but the 2017 SUV is expected to retain the existing car's £23,000 starting point when it arrives in August 2017. 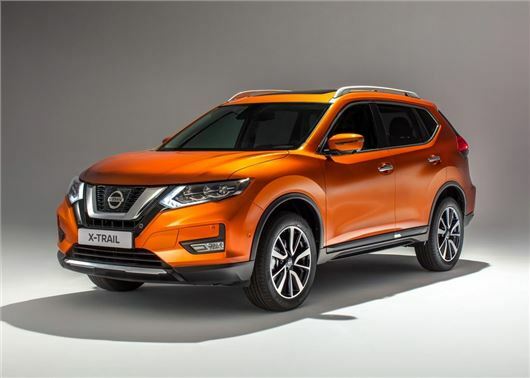 Most of the big changes are found on the exterior, with the Nissan X-Trail getting a much sleeker appearance, with LED daytime running lights, thinner bumpers and a wider 'V-motion' grille. Nissan has also added a new range of 17 and 18-inch allow wheels, along with four new paint colours - Orange Pearl, Red Pearl, Blue Pearl Metallic, and Dark Brown Pearl. Thanks to revised interior packaging, the boot is now 15 litres larger than before, with 565 litres available with the second row of seats in place on the five-seat version. Bootspace for seven-seaters is still TBC, but Nissan tell us that all X-Trails will offer a whopping 1996 litres of storage with the rear seats flattened. As before, all versions will be offered with Nissan’s innovative Luggage Board System, which allows for shelves and dividers to be adjusted into any one of nine different configurations. These include a hidden compartment to keep valuables out of sight. The second row of seats will also have sliding and reclining functions, allowing those in the back to get comfortable. Standard equipment levels have been bolstered with all X-Trails getting DAB audio as standard, while models in range-topping Tekna trim will get an all-new eight-speaker BOSE Premium audio system. The options list will also include adaptive cruise control and autonomous city braking, with pedestrian recognition. Under the bonnet, the engine line-up remains unchanged, with two diesels and one petrol. The diesel range starts with the 130PS 1.6 (with a six-speed manual gearbox or CVT XTronic). A more powerful 2.0-litre diesel with 177PS will also be available, along with the option of two-wheel or four-wheel drive. The 163PS 1.6-litre petrol will be limited to two-wheel drive only, along with a manual gearbox only. Claimed economy for the diesels will range from 50.4mpg to 57.7mpg, while CO2 emissions will start at 129g/km for the 130PS and rise to 158g/km for the 177PS with four-wheel drive. The four-cylinder petrol will provide an advertised 45.6mph and 145g/km.